The image to the right, shows a detail of a few of the cells that form the perivascular fiber band, that completely circumscribes the vascular tissue in the Pelargonium stem. Note that the fibers contain plastids, as well as other evidence that they are not dead, but living cells. Also note that the lignin is not uniformly distributed throughout the cell walls. 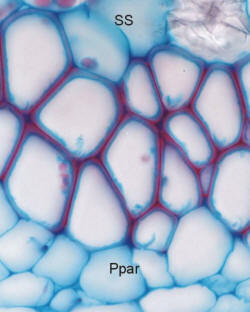 The layer of cells immediately above the fiber bands, is the starch sheath, and, as such, the underlying fibers are not cortical, but have their origin in the stele, You can see some phloem parenchyma (pPar) beneath the fiber band. Sieve tubes and companion cells are not visible in this micrograph.